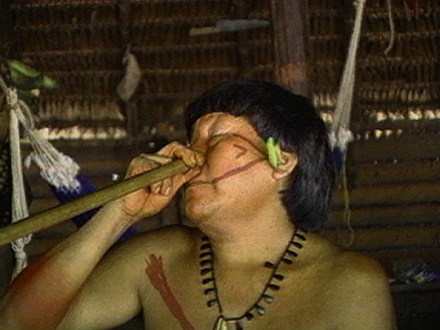 From the Other Side of the Sky explains the importance of religious ritual for Brazilian Indians and shows the diversity of religious practices among various groups. The Yanomami Indians, as one of their shamans explains, believe that Omami, the creator, holds up the sky. If no one practices religious rituals the sky will fall down. Guardian of humans and nature, Omami takes care of everyone, including whites, because as the shaman says, "do you think the government will?" Pankaruru people reach their creator via "the enchanted," spirits summoned by a ritual called "the toré" that involves dancing and elaborate costumes. Maxacali society practices "hawk religion," in which animals play a symbolic role. The video shows Maxicali people playing the Otter game, in which a man disguised as an otter spirit playfully snatches a child as the whole community watches and jokes. The creator "gave each tribe a religion. We have ours, and they have theirs," a Maxacali leader explains.